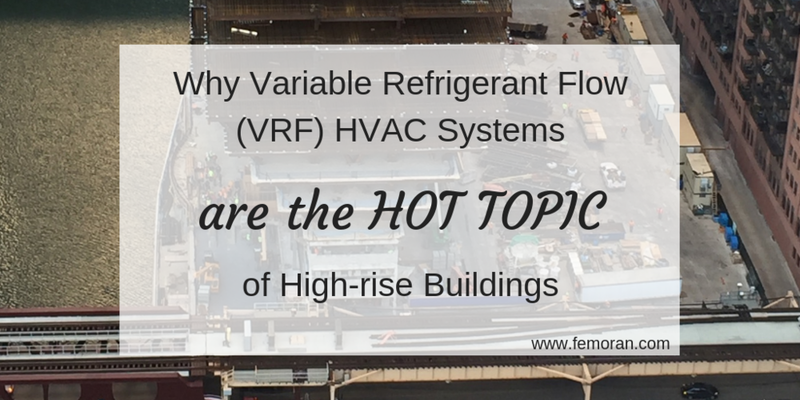 Purpose: The purpose of this article is to teach facility managers, property managers, and building engineers about the stress high-rises put on HVAC systems and how Variable Refrigerant Flow (VRF) HVAC systems can ease those issues. What are the main problems that high-rise buildings have with HVAC systems? How can VRF systems help high-rises with HVAC issues? In 2002, a 15-story high-rise in Maryland began its decent into decay. It sat vacant for ten years after being declared a sick building. In 2012, Caves Valley Partners bought the building and brought it back to life. The company made it a state of the art Class A building. The Maryland building was renewed with a glass curtain wall façade, a new electrical system, and - most importantly - a brand new Variable Refrigerant Flow (VRF) HVAC system. The VRF system not only made the air quality healthy again, but earned it LEED points toward a silver certification. The building is now occupied by Towson University and MileOne Automotive. A proper HVAC system is an integral part of a high-rise building. High-rises need to meet multiple tenant's comfort needs, while being quiet, providing healthy air, and being low maintenance. With the varied needs of high-rise occupants, VRF systems are the future of high-rise HVAC. High-rises deal with a host of HVAC difficulties. With multiple tenants and different needs, a lack of proper maintenance or an inefficiently designed system could result in poor indoor air quality (IAQ), noise, inconsistent airflow, loss of efficiency, and high costs. These issues can cause sick building syndrome. Sick building syndrome is a condition that affects office workers, giving them headaches and respiratory problems due to poor ventilation and air quality. In 1984, the World Health Organization (WHO) reported that up to 30% of high rises and other office buildings are causing their occupants to get sick due to poor IAQ. Sick building syndrome is a result of flawed Heating, Ventilation, and Air Conditioning (HVAC) system design. Common HVAC issues associated with this illness are mold, improper exhaust ventilation, or lack of adequate fresh-air intake/air filtration. The wrong-sized ducts are the plight of many HVAC-related issues. Noise can be caused by the wrong sized ducts - which can also cause an increase in cost and space. If ducts are too small, the system will make noise and rattle because of airflow restriction. If the ducts are too big, low airflow will cause uneven heating. With improperly sized ductwork, efficiency can be lost by up to 60%. This will cause an increase in utility costs, a struggle to reach the set temperature, and the need for more repairs on motors, fan belts, and compressors. The wrong sized ducts can put so much strain on the HVAC system that it will likely need to be replaced earlier than its estimated life. HVAC systems account for 40-60% of utility costs in a commercial facility. These costs can be greatly reduced with smart HVAC technology. High-rises need an HVAC system that can anticipate and minimize operating and maintenance costs, allow personalized control, maximum flexibility to accommodate changing tenants, and reliability. A solution that meets these needs is a Variable Refrigerant Flow HVAC system. Variable Refrigerant Flow (VRF) technology solves many of the issues high-rise buildings suffer from due to multiple tenant needs, mechanical space needs, and overworked equipment. VRFs are mostly ductless, saving space, and use a condenser unit that works with multiple users. It eliminates the need for water piping, requiring only refrigerant piping. The result is lower utility costs, less space used, and better individual temperature control. VRFs work like a more efficient ductless multi-split system. There are multiple indoor evaporator units connected to one outdoor condensing unit. They work only as needed, providing a significant energy savings from partial load conditions. Over the lifetime of the system, VRFs are predicted to provide almost 50% energy savings over the average HVAC equipment. The simple design provides many benefits: energy efficiency, the inverter-driven compressor technology simultaneously heats and cools without duct loss; zoned comfort, each zone has personalized comfort, providing the right amount of refrigerant when needed for each space; quiet operation, indoor and outdoor units are quiet and can be used anywhere; easy maintenance, VRFs generally only need filters changed and coils cleaned; lower lifecycle cost, they operate with minimum energy usage and you can service zone by zone rather than the entire system; and safety, VRFs have less airborn allergens because they do not re-circulate air. VRFs are easier to install than traditional HVAC systems because they are modular, lightweight, and smaller, making them ideal for both new construction and retrofit. In addition, the piping is smaller, allowing the system to fit into standard size walls and giving the owner more usable space. In Chicago, a study by the Georgia Institute of Technology (2013) shows that office buildings can expect to save 46.5% in energy bills with a VRF system. The same study found that in Chicago, the total life-cycle cost of a VRF system in an office is $2,255,772 while the average HVAC system will cost $2,329,981 over the life cycle. While the cost to install a VRF may be more up front, it saves building owners 3.2% over its lifetime with lower maintenance and utility bills. It would take only 10 years of annual utility savings and reduced maintenance needs to make up the cost of the initial installation. As green technology and energy efficient building systems grow in popularity, high-rises will be at the forefront of this technology. With their multitude of needs and high cost of utilities, high-rise buildings get the opportunity to truly reap the benefits of newly emerging eco-technology. VRF systems have only been in the United States for about ten years, but high-rises that are at the forefront of building technology are already adapting this new technology and seeing the long term benefits first hand.